Charts Also Move Markets: Support, resistance, and momentum indicators also move markets, especially in the absence of surprises from top tier news and economic reports. For example, the stronger a given support or resistance level, the more likely a trend is to pause at that point. Similarly, a confirmed break above key resistance makes traders much more receptive to positive news that provides an excuse to trade in that direction. 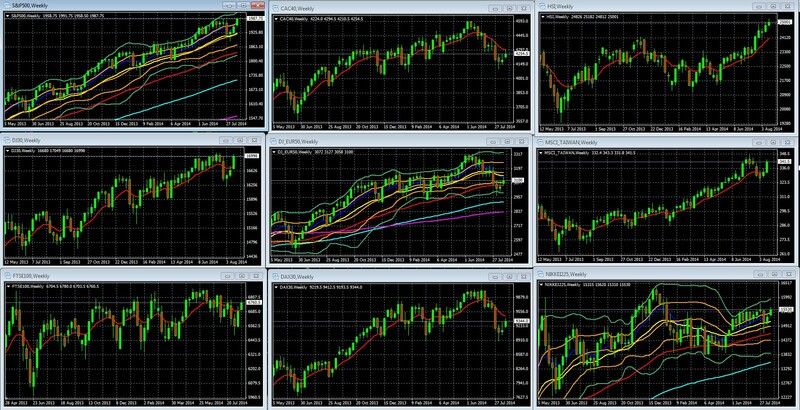 Key For S&P 500, DJ EUR 50, Nikkei 225 Weekly Chart: 10 Week EMA Dark Blue, 20 WEEK EMA Yellow, 50 WEEK EMA Red, 100 WEEK EMA Light Blue, 200 WEEK EMA Violet, DOUBLE BOLLINGER BANDS: Normal 2 Standard Deviations Green, 1 Standard Deviation Orange. Overall, US and Asian stocks not only remain in their medium term and long term uptrends, last week they also regained their upward momentum as they closed the week within their double Bollinger® band buy zones, thus putting the odds in favor of further net gains in the weeks ahead. Note that these trends remain positive (with indexes at nor near all-time highs in the US) even though US data reflects only modest recovery in the US and both China and Japan have seen slowing growth. In contrast, European stocks remain in a medium term downtrend even with their modest weekly gains. On the bright side, that bounce got them out of their double Bollinger® band sell zones, and into their double Bollinger® band neutral zones. The change is significant, as it puts the odds in favor of more flat, range trading rather than more material declines in the weeks ahead. So what was behind the rebound? Perhaps the better question is, why shouldn’t they have rebounded? We repeat once again that the rally that began in March 2009, and which has continued virtually uninterrupted since September 2011, has rested on the assumption of continued low rates and ultra-accommodative central banks, and lack of any material fear factor lack the EU crisis. Rates To Stay Low: Regional data themes remain unchanged. The US continues to recover slowly, allowing guarded optimism without imminent threat of rising rates. Asia is a mixed bag, and Europe continues to deteriorate (more on that below, as well as in our weekly EURUSD outlook), but that brings hope of more ECB stimulus. Overall, globally there is nothing to suggest rising rates any time soon. No Big Scares: Yes, Russia’s soft “humanitarian” invasion of Ukraine is an escalation that suggests another round of sanctions, but these have yet to do any material damage. Moreover, markets appear skeptical that the West is ready to make deep sacrifices for Ukraine. Other areas of geopolitical tensions remain even less of a threat The EU crisis remains in hibernation. In short, the weeks’ price action was just part of the normal “noise” of gyrations within the overall US, Asian, and European risk asset trends. Continued Ukraine escalation. The Ukraine crisis remains the most likely source of volatility and packs the most potential for driving markets up or down in the near term. It has the potential to be a long term drag for Europe, as the escalation in tensions that began in June is mirrored in our sample European indexes. Top economic calendar events highlighted below. It’s a typical late month calendar that’s light on top tier events with potential to move markets. As mentioned in earlier posts, EU data is more important at this stage because the ECB’s policy is still in flux, with more easing a matter of when, not if. As the past week’s bounce illustrates, as long as markets remain convinced that central banks remain accommodative and there are no big scare events, global markets can rise even when growth is weak and the Ukraine escalates. Although in the near term the story is “more of the same,” there were nonetheless some important lessons to be learned from the past week. With EU stock indexes badly underperforming those of the US and Asia, EU economic data varying between weak growth and deep recession, and the EUR looking terrible from all angles, (details here), it’s no surprise that many are again focused on the EU’s depressing state and what can be done about it. Here we’ll focus on just two existential threats that were in focus this week, and their immediate solutions and broader implications for the EU. Back in January of this year I argued here that the EU would ultimately have to choose between its own economic collapse and accepting massive money printing to fund a US or even Japanese style central bank stimulus program. The past week saw an outpouring of articles concluding the same, from far more credible writers than yours truly. As we’ve written about repeatedly in the past (see here, here, and here) the EU banking union pact is too underfunded and slow to deploy to provide any likely practical help, or credibility, for the stability of EU banking. ECB stress tests results are due out October 17th and could rock markets in a number of ways, regardless of whether the tests are rigorous or another low-standard public relations exercise like the prior two tests. The New York Times came out last week with a report on how there’s a growing group of analysts that believe the coming ECB stress tests will be rigorous and thus reveal that EZ banks will need additional cash. Using the “Texas Ratio,” a metric developed to evaluate Texas banks during the Savings and Loan crisis of the late 1980s, a variety of analysts and investment firms using this metric have concluded that far too many EU banks are undercapitalized relative to the size of their estimated bad loans. See here for details. Here too, the common theme among analysts is that the ECB needs to be ready to either recapitalize banks that can be salvaged, or close those that can’t, yet avoid inflicting so much private sector losses that markets panic, as well as imposing politically unacceptable burdens on taxpayers. Again, see our special report here for details and implications. Will Russia continue escalating its Ukraine invasion? Will data continue to show the US economy pulling away from the EU? If so, is that improvement enough to justify rising expectations about the scope and pace of Fed tightening? Will the above mentioned calls for an ECB that can create money and fund as much stimulus and bank rescues as needed to heal the EU gain widespread traction? Will Germany abandon its opposition to a ‘soft money’ Euro as deflation presents a greater threat than deflation? To be added to Cliff’s email distribution list, just click here, and leave your name, email address, and request to be on the mailing list for alerts of future posts. 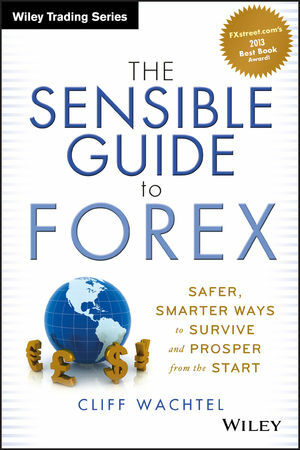 For information on a free intro to currencies video course based on my award winning book, see here.